Despite storm Eric aiming a well aimed karate kick at Hardy Farm on friday, only the U11’s had to make do with a sub standard Chorlton Park this weekend. The Ancient groundworking custom of “Forking off” (sticking a pitch fork into the ground to see if it remains vertical) was ritually performed according to the old viking ways by our very own semi naked curator on a blustery friday afternoon in the ‘ville. The beacons were duly lit, and the welcoming battle cry of “Let the games go forth” was excitedly bellowed across the deserted, soggy outfield. U9 Owls lost 6-2 at home to Sale Utd. Our feathered friends went 4 down without reply before. Jude pulled 2 back to give them hope (1 penalty). Alas Sale snuffed all hope out with 2 more of their own. All of the Owls played well even in defeat and despite the score, played their socks off! 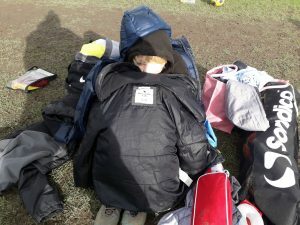 U11’s took a punt, literally, on playing at Chorlton park. It was already feared that the game would possess more Gary Owens than a night out in Cardiff, and their concerns were soon justified. The referee took one look at the “Cow Field” and declared it unfit for human consumption. They slugged out a “physically demanding” friendly instead that featured as many hoofs as the Grand National. Under 12’s won 4-3 v Wythenshawe amateur pumas on the under 13’s pitch. Big thanks to under 13’s for letting us do that. Goals: 2 Iwan Thomas 1 Gabe Lansley and 1 Jack Hill. Both ref and oppo manager said how well the boys played and were very good technically. Your correspondent witnessed the last 20 minutes and could not believe the size of the opposition. The Quinoa-rich diet of the average Chorltonite is clearly no a match for the Sale equivalent. There would have to have been a literal Giant killing if the badgers were going to prevail. With x2 fitness doubts, and suspected TB on many a feathery chest, the U13 Magpies resembled a herd of wounded antelope when faced with the Lions of South Manchester this Sunday lunchtime. It’s the kind of age group where you turn up and immediately look to see if the opposition have one or more freakish giants in their ranks. Unlike the Badger’s game before us, there was only one. The pre KO line up revealed he was called David. “Which one?” came the booming baritone reply, “The one that actually looks like a Goliath” squeaked West’s dwarfed coach. Despite the sticky pitch, we tried to pass our way through and round the fast counter attacking Lions. The striking dynamic Magpie duo worked well in tandem all game today. It was classic back to goal stuff from Ioannis as he spun and played Jack in to run through and calmly add to the Hitman’s growing haul. The wounded Lion is a dangerous animal and they wasted no time in countering with a well taken equaliser. The absent, crumbling Stretford wall (Kit Jordan), who minutes before limped off at centre back to spend the rest of the game hiding from the hungry Lions was probably crucial. Enter Goliath..an errant pair of size 12 boots left a nasty rake mark down the Achilles of our other centre back. We conceded again in the middle of a makeshift re organisation to go down 1-2. Grrr. Whilst the whacky Aki was negating the need for his Vidal Sassoon coiffeur appointment later that day, and pulling his own hair out, our own dynamic duo were at it again to combine for another neatly made and taken goal to get us back in the mix at HT 2-2. Ralf limped back for the 2nd half and robustly bossed the back line and the attacking threat like a certain Dutch Scouser.. to pick up POTM. In a second half that could and perhaps should have gone either way. We carved out and spurned a couple of great chances that will have a few of us waking up in cold sweats over the next few gameless weeks. The winning goal came from the boot of their Hollywood number 10. A cross come shot from the left edge of the box that looped over the faultless Fin in goal. A triumph for both David and his Goliath. A painful parable to learn from. U15s away game was postponed, so played a self contested 5 a side. The dramatic script of the U17 season continued to follow a curious course as this week the opposition were under investigation for fielding a suspended player in the previous round. Head Honcho Eamonn, wisely pointed out not to field a player wearing suspenders for future reference.